The Crawford Sofa and Loveseat, two-piece livingroom set is designed to give every person the space they need to relax and unwind. 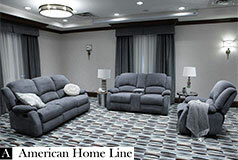 It’s upholstered in an ultra-soft, grey, polyester fabric that is easy to maintain and ideal for busy households. 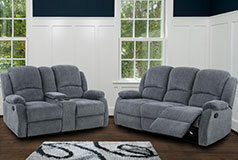 The Crawford lets you recline in various positions from fully back, semi-reclined to upright. The plush cushions give you all the support you need with the pillow arms, back cushion and seat. 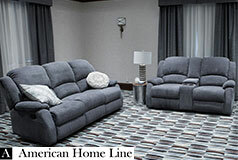 The loveseat features a centre storage console, ideal for storing remotes. The built-in drink holders make it the perfect spot to lounge with everything at your fingertips.